So after waking up in the wee hours of the morning to hear the cats frolicking outside as they do, I fell back asleep. I knew things were headed south with the condition of my nose and the passages therein. I woke up enough to tell my oldest goodbye as she headed off to work. Then I dozed. And finally woke up to the stirrings and requests for breakfast of my littles. I looked the clock. I could not believe my eyes, but yes, that was the correct time, even after rubbing them and putting on my glasses (after working to find them–that whole “I need my glasses to see where I put my glasses”–ahem). At least a tad bad. But the laundry was piling up and the sink was too, so I unloaded and loaded and washed and folded and then pretty much crashed around lunchtime. The symptoms I had figured were allergies for others in my house? Pretty much thinking I misdiagnosed, and this bad boy is a COLD. How did that even happen? I’ve been eating fresh vegetable soup all week. Anyway, I did lay down to rest this afternoon, hoping to give the old immune system a boost. It didn’t last long. My mind was on my freezer. And peaches. My favorite variety of peaches are ready. Now. For a limited time. I’ve been known to go down to the farm and get five boxes of peaches and put them up in the freezer over the next few days. We canNOT be without peaches during the winter. It made me laugh one day last winter when I served the canned peaches I got on sale (I know, *gasp*) and my little guy who is a peach fanatic, asked, with a sour look on his face, “WHAT are these?” Yeah, I don’t do that anymore. Lesson learned. And I have to say that I am proud that he’s a little peach connoisseur, my little Georgia boy. So it’s time to go and get my peaches and put them up. 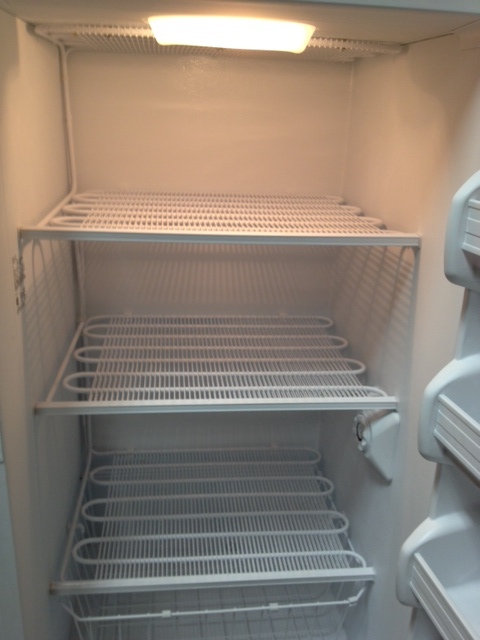 But my freezer. It’s not so good. It has needed defrosting for oh, let’s say, about a YEAR. The ice takes up more space than the food, and the food in there was starting to be frozen together. This does not work so well. So today, I felt awful, but I couldn’t rest knowing time is of the essence, so I got my act together, enlisted the help of my Zoo Crew, and we moved food into the small freezer and cooler and went to town trying to get it to defrost as quickly as possible. So yeah, this happened today. Feeling pretty good over this much needed job finally being done! 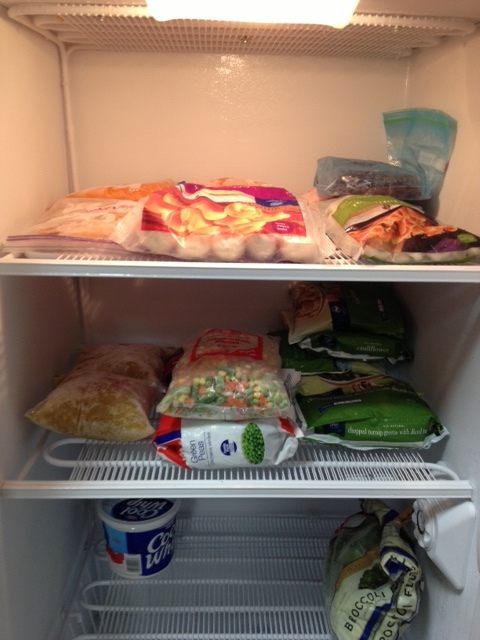 Only thing left is to move the other things back from the little freezer tomorrow. Whoo hoo! Despite feeling yucky, I got it done with the help of my crew. The wet towels are already headed toward the dryer, and it all only took one phone call to my Aunt to check that I was following the proper procedure. I’m calling it a win. Mama had a saying when she got the dusting done (which she despised) or did something she’d been putting off for a while–she’d say she was feeling “sanctimonious.” I think it got started when Mama called to tell my Great Aunt about her accomplishment one time, my Aunt W replied, “Aren’t you feeling sanctimonious?” The first thing I used to do after I mopped my floors or finished all the laundry AND put it away or finished putting up the five boxes of peaches I’d inflicted on my kitchen was to call Mama and tell her. She was more than Mama, she was my best friend and I wanted to share. And I knew the first thing she’d say would be just that: “Well aren’t you feeling sanctimonious?” Yes ma’am. For sure. Tonight I was blessed to have my Aunt listen, answer my “technical” question about what I was doing, and say, when I suggested (ahem) I might be feeling sanctimonious, “Well I guess you should be.” She and Mama shared that too. Because there’s some things in life you should feel that way about…..like defrosting freezers when you just want to crawl back in bed (or just defrosting them at all–seriously), putting streusel in a pound cake (Imma need that recipe please ma’am), or dusting an entire house when it’s your least favorite task of all. When we set our minds to something and get it done, isn’t it nice to have someone to share it with, to pat us on the back, and to cheer us on? Tonight I’m thankful for a clean freezer with food in it, and the anticipation of putting more in it (whoo hoo, Elberta peaches). I am grateful for my children to pitch in, the many hands that make a task a little easier. And I’m thankful for Mama who cheered me on, and for those, who like my Aunt, continue to do so. Lifting each other up–that’s the good stuff in life. Just like fresh Georgia peaches, there’s nothing else like it.